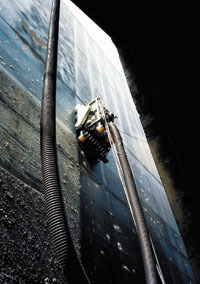 Type:UM's main unit adheres to the wall by vacuum and self-propels while the support unit is installed on the ground. The main unit consists of a suction disk fastened with many polishing cloth tips by means of pieces of Velcro, and four drive wheels. The support unit consists of a Roots type vacuum pump unit, a bag filter unit, two auto-tension winch units and an electronic control unit. For efficient pre-painting work on surfaces, the suction disk of the main unit rotates and does the polishing.